I've been thoroughly enjoying Land of Plenty , and I feel like I've only scratched the surface of this cookbook. I particularly appreciated learning about new traditional ingredients, many of which would have been hard to find when I first started trying my hand at Chinese cuisine — and even if I had found them, the available cookbooks, generally speaking, did not use them. We've tried 20-some recipes, and there were only one or two that we did not care for (for example, the Cauliflower with Smoky Bacon, but I did overcook the cauliflower and overcooked cauliflower is less than great). So many untried recipes remain yet bookmarked with little slips of paper. Boiled Aromatic Peanuts, which Joe hopes will be similar to the peanuts we had at Chung King. And then there's the sweet corn kernels with green pepper that we are both hoping is similar to a dish we had a Sichuan restaurant in Beijing, but I'm waiting until the summer when we can get corn fresh from the harvest before trying that one. I have a few Asian eggplants in my refrigerator that will be destined for either the "dry-fried" or the "fish-fragrant" in our near future. (I've already tried the stuffed eggplant fritters.) And there's also lotus root in sweet and sour sauce, and I've never cooked with lotus root before. (We have several of those in our refrigerator right now too.) And then, because I love to see how these dishes contrast with what's found in American Chinese restaurants, there are the beef with tangerine peel and the sweet and sour pork. I tend to think of the latter, especially, as an American dish but I know it's based on dishes that are authentic to China. So many dishes and so little time! After having this dish in China, and seeking it out at restaurants back in the U.S., I finally decided to try making it myself. One of the first things I did when we received Fuchsia Dunlop's very authentic looking Land of Plenty was to look up dishes we had enjoyed in China. The "boiled fish in chile oil" was at the top of the list. That was several years ago. The knowledge sat there in the back of my head, with a nice comfortable feeling that should the urge ever move me I would be able to try doing it. The urge finally moved me. I came home with some fish and shrimp intending to make... oh, I can't even remember what I intended to make. Oh, that's right, I remember: Goan fish stew, a very nice coconut curry. Then Joe reminded me that the Sichuan book has a lot of fish recipes, and we'd wanted to try some. So I looked it up and got excited. Though it seemed like it would take a long time, it's really not that bad. Each individual step was quite simple, and there was minimal chopping and dicing. This dish looks terrifyingly hot with all those chiles, but the heat is actually very adjustable. Neither Joe nor I thought the recipe as cooked was especially hot (this might be due to the kind of chiles I used) and I'll probably up the chili and sichuan peppercorn level next time. (Important note: you don't actually eat the chile oil, and a lot of the spicy heat doesn't actually linger on the fish.) 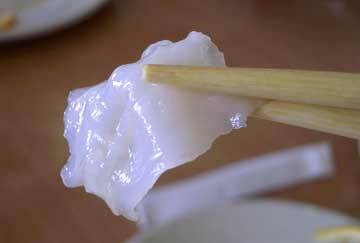 The fish, with its light cornstarch coating, has a lovely silky feel. I added in some shrimp, which we both thought were splendid cooked this way. We served it with white rice, using a slotted spoon to scoop up "base flavorings" to put over the rice. These days I'm frequently looking for recipes that make use of the vegetables I receive from Tantre Farms, and right now we've an abundance of corn. So this Grilled Corn recipe from epicurious.com was a perfect fit. The corn is grilled in its own husks and cut off the cob and mixed with herbs and this amazing Lime Butter Sauce (another perfect fit for me as I had a lime sitting at home that needed using). I used sage, chives, basil, and French tarragon as my herb mix. I especially enjoyed the sage. I think if I were do this again I would try a sample with sage and chives, and another small sample with tarragon to see which herb I liked better. But the star of this meal was the Grilled Salmon, grilled and slightly charred with lime zest and lime butter sauce drizzled over the top. I'm no expert at grilling. My usual mistake is to misjudge the heat of the grill and overcook the hamburgers. Joe and I both like our hamburgers medium rare, and medium is really just too done for our tastes but that's often what we end up eating. I figure fish should be easier to check. I season it with Portuguese sea salt and black pepper and it's ready to go. Of course, the first thing I do -- I'm in a hurry -- is misread the recipe, and I put the salmon skin down on the grill. (It's supposed to go flesh side down.) By the time I notice this, the salmon skin has glued itself to the grill — so I leave it be. 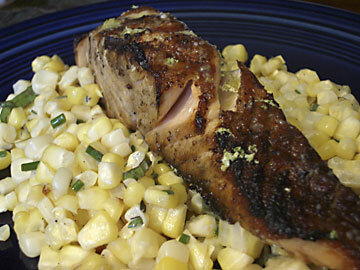 All I can say is that in spite of, or perhaps because of, my grilling mishaps this salmon was stellar. Joe couldn't stop raving. The slightly charred surface with speckles of sea salt was incredibly flavorful, and the salmon only required a very small amount of the lime butter to dress it up. Per Everyday Wines' recommendation, I paired it with 2005 Seigneurs de Bergerac, Bergerac Sec, a dry French white with a delicate nose and a almost fruity finish with a touch of spice. From the bottom right and moving clockwise: Pea Tips with Garlic, Roast Duck, Wide Rice Noodles with Beef and Vegetables, Crispy Pan-Fried Noodles with Beef, Shrimp with Honey Walnuts, and Whole Sole Steamed with Soy Sauce, Ginger, and Green Onions. I want to welcome new readers who may have found me through the short article in August's Ann Arbor Observer. We — that is to say both myself and Joe — were very excited when an Observer reporter contacted me about doing an article about Kitchen Chick. I was very nervous when the article came out, and I made Joe read it first. The reporter did a great job, and I'm very happy. If you're local, grab a copy of the Observer and check it out. You might think the above photo looks a little familiar. The photographer took a photo of me taking a photo of that fabulous spread my group enjoyed that night. So now you see what I was seeing while he was taking the photo. I most often use a Pentax Optio S4 for my food photography. It's discreet and does a good enough job for web photos. I don't like to use the flash unless it's absolutely necessary because I don't want to disrupt the other tables around me. I also use a Nikon D70. The garam masala spice photo in an earlier post, for example, was taken with the D70 and a macro lens. I color balance and adjust the contrast in Photoshop. Back to the food... Joe and I have been going to Great Lake since they opened way long ago in the 90s. Heavens, I can't even remember when that was. I think I was still in grad school. We held our wedding reception at Great Lake and served an immense 10 course banquet. We thought 10 dishes with 10 people per table would be good enough to make sure no one went home hungry, but we had no idea that the courses would come served on huge banquet platters, resulting in more than twice the amount of food we expected. I had to announce after the third course that seven more were coming -- not counting the cakes! Let's just say there were leftovers to take home for everyone who wanted some. 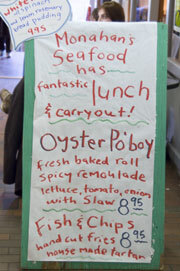 Longtime Kitchen Chick readers will know that I rave about Monahan's Seafood in Kerrytown quite a bit. There's no affiliation, it's just one of my favorite places. 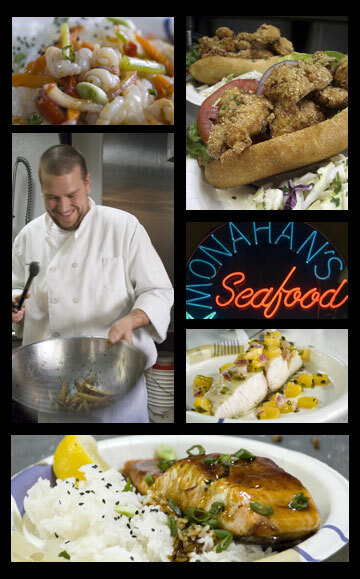 Known by many as the best place to buy fresh fish in Ann Arbor, Monahan's has also been quietly serving lunch on the side since the late 90s. 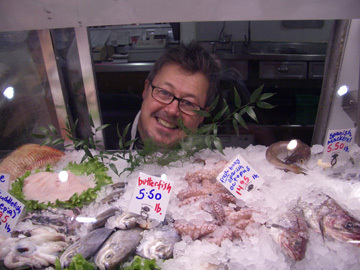 In 2004, Mike Monahan hired CIA student Chewy Lebnick for the summer, and he brought us fabulous meals like Seared Bonito. Years and years ago, I'm told, Ann Arborites had to go to Toledo, Ohio to find a good dinner. Now, Ann Arbor is a restaurant mecca, but there's still occasionally a reason to head to Toledo for a meal. Wei Wei Noodles is one of those reasons. Plan to go hungry so you have plenty of room for a feast. 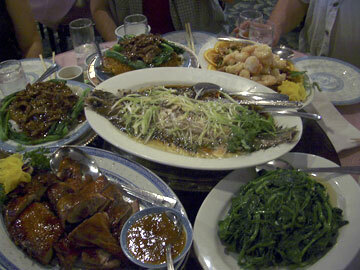 The menu is mainly Chinese dishes with a few others, such as Vietnamese summer rolls and miso soup. 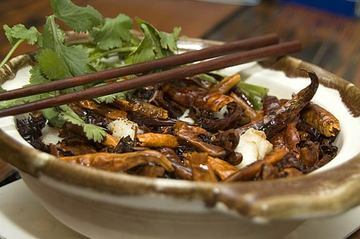 Many of the standards we've come to expect at Chinese restaurants in the States are there, but the stars of the menu are the noodle dishes and the special seafood dishes. Joe's parents adore clams, mussels, oysters -- any seafood in a shell -- and they were particularly delighted to discover the geoduck and razor clams and knew they had to share their discovery. A date was set and we all went to Wei Wei to experience the marvel that is... the Geoduck Clam. Mike Monahan, of Monahan's Fish Market, posing with a few of his friends. We went there for brunch this morning (Spanish mackerel with Swedish-inspired mustard and dill sauce, which was wonderful but the pictures didn't turn out). When I came home with a bag of fresh shrimp I had in mind a lovely shrimp casserole with mushrooms cooked in white wine, but I forgot the mushrooms. Darn it. So a quick look through our cookbooks turned up this recipe comes from a 1993 Food & Wine collection. I skipped the skewers and spread the shrimp and bread on a tray and broiled them in the oven. Joe called it "odd but very tasty." I have to agree, and I think the bread choice will affect the flavor combination quite a bit. I used Zingerman's Roadhouse Bread, which is a full-flavored bread with a neat slightly sweet flavor with a touch of sour. Grilled Shrimp and Country Bread 40 lg shrimp, shelled and deveined 40 cubes of country bread, cut into 1.5 inch cubes 40 sage leaves 3/4 C extra-virgin olive oil 1 Tbs finely chopped fresh rosemary 4 garlic cloves, minced Juice of 1 -2 lemons If you use skewers... soak your skewers in water for about 15 minutes then thread 1 shrimp, 1 bread cube, and 1 sage leaf per skewer. 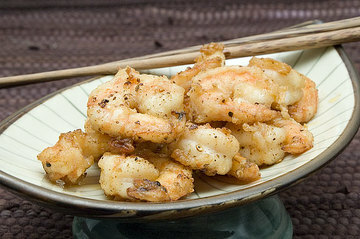 (This recipe was intended as an appetizer, thus the one shrimp/skewer directions.) Arrange skewers in shallow baking dish. Or just mix the bread cube, shrimp, and sage in a shallow bowl. In a small bowl, whisk to combine the olive oil, rosemarry, and garlic. 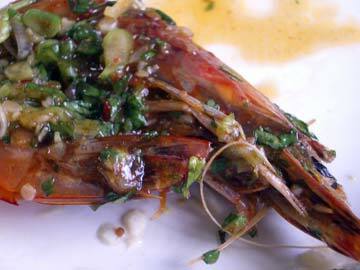 Pour over the shrimp and bread and marinate at room temperature for at least 1 hour or refrigerated for up to 1 day. Light grill or preheat broiler. Grill/broil skewers for 3-4 minutes until the shrimp are just warm and the bread lightly toasted. If you don't use skewers, spread the shrimp and bread mixture on a tray and broil as directed -- make sure to turn them over to cook both sides. Sprinkle with lemon juice and serve. I love fresh spring rolls. When at a Vietnamese restaurant, I find it almost impossible to not order them. Green or red leaf lettuce, sliced or shredded. Hard ribs removed. Put noodles in a large, heat-proof bowl. Boil water. Pour boiling over the noodles and leave to soak. Shred or slice lettuce. Shred or julienne carrots. When the noodles are soft, drain and set aside. Fill a shallow pan large enough to hold a rice paper sheet with very warm water. Slide a rice paper sheet into the water. Let it soak until almost soft. I like to have parts of the sheet still feel very slightly stiff. These parts will soften even after they've been removed from the water. Otherwise, if the rice sheet is completely soft before I remove it from the water, I can be fairly certain I'll tear the sheets. Lay the sheet out on a clean work surface. Put some noodles (1/4 cup or so) across the bottom third of the sheet. 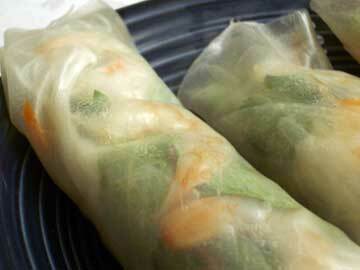 Layer it with lettuce, carrots, mint or cilantro, and three or four shrimp halves. Roll the bottom edge over the fillings. Tuck one or both sides up — whichever you like. Then tightly, but don't pull too tightly, roll it up. You'll figure out how much filling to use and how much tension to put on the rice sheet with practice. Heat the oil and add the garlic, chili paste, and tomato paste. Fry until garlic is golden brown. Add the broth, sugar, peanut butter, and hoisin sauce, and whisk to dissolve the peanut butter. Bring to a boil. Reduce the heat and simmer for 3 minutes. Garnish with the ground peanuts.